Most critics beat against the tide of Americanization, but it's not always bad, and if you disagree with that, your governor WILL KILL YOU! Plus, now, there's Mission Chinese Food. Taking over the the divey space that used to house Mission Street Food, MCF's a blessed homage to "Americanized Oriental food" from the pop up's same dudes -- Asian line cooks who're elevating the delicious, yet much maligned genre with super fresh ingredients, and using the term "Oriental" in a Eurocentric/romanticized way that's meant to be non-racist, like your grandfather, except the opposite. The eat-in/take-out menu rocks 10-12 affordably inventive items, including salt cod/Chinese sausage-fried rice, braised Mongolian beef cheeks (with onion, scallion, horseradish, etc. 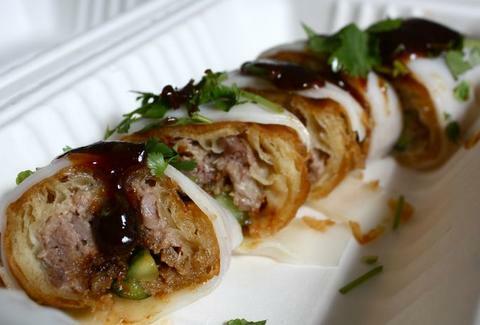 ), and a long, fried Chinese doughnut wrapped in rice noodle and stuffed with cucumber, cilantro, and crispy Peking duck, aka the "Chinito" (see picture, leave office now). Beyond that, there's half or whole chickens that're roasted in burnt wine sauce and Hainan ginger, super spicy "Ma Po" tofu with Kurobuta pork n' Szechuan peppercorn, and Middle Eastern nods like Islamic lamb hot pot with pickled celery, chili oil, and the tendency to not appreciate cartoons even if they aren't Hagar the Horrible. Sticking with the holiest of Mission Street Food's original tenets, MCF'll let you BYOB. Plus, if you're lazy/a man, they'll deliver your grub within 45min, since nothing's more American than getting fat while watching Commando, especially when you're going Commando.